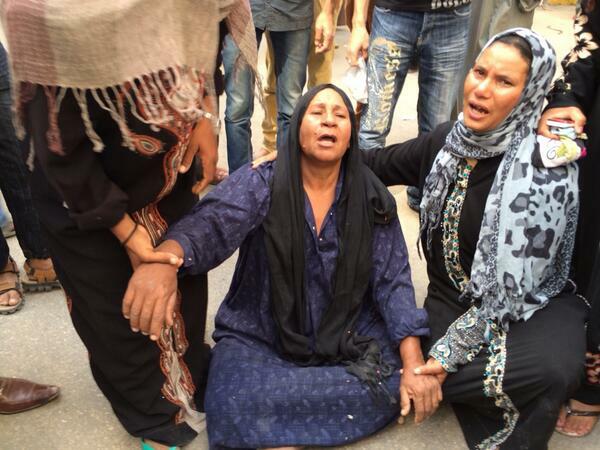 Another mass trial outrage in Egypt with 549 people sentenced to death. The world must and will react! Families don't know which names are among the 37whose death sentences were confirmed of 529 originally sentenced. An Egyptian court has sentenced 683 people, including Muslim Brotherhood leader Mohamed Badie to death. In a separate case, the same court also reversed 492 death sentences out of 529 it passed in March, commuting most of the death sentences to life in prison, the AFP news agency reported. Monday's hearing in the southern province of Minya comes amid a brutal crackdown on Morsi supporters and the Brotherhood since the military overthrew him last July. The court has come under the spotlight after the same judge in March sentenced the 529 defendants to death in just two sessions. 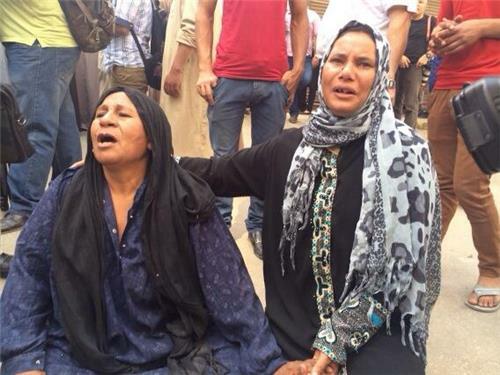 The second batch, including Badie, had faced charges of the murder and attempted murder of several policemen during rioting by Morsi supporters in Minya on August 14. Supporters of Egypt's ousted President Mohamed Morsi say they will boycott the country's upcoming presidential elections. An alliance led by the Muslim Brotherhood said in a statement on Sunday that the presidency is "not vacant." They called the upcoming May 26-27 election a "farce." Former Field Marshal Abdel-Fattah el-Sisi, who led the overthrow of Morsi in July after millions demonstrated against him, is the front-runner in the upcoming elections. He faces Hamdeen Sabahi, a former left-leaning presidential candidate, in the vote. An Egyptian court has sentenced 42 supporters of deposed president Mohamed Morsi to prison terms ranging from three to 15 years on violence-related charges on Sunday, a judicial source has said. The verdict was delivered by Said Youssef Sabry, the same judge in the southern city of Minya who last month sentenced to death 529 alleged Islamists in a verdict that triggered international outrage. Sunday's sentencing of 42 Morsi supporters come a day before Sabry is expected to issue a verdict on another batch of nearly 700 alleged Islamist defendants for the murder and attempted murder of several policemen last August. 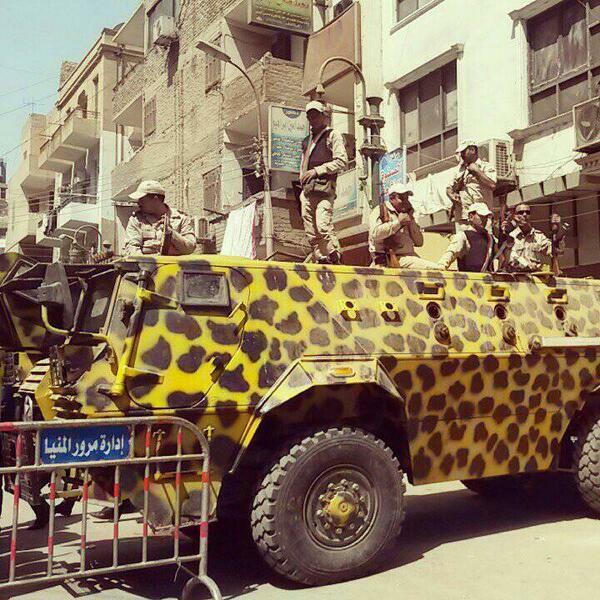 Since the army ousted Morsi last July, a government crackdown has killed more than 1,400 people, mostly supporters of the deposed president, and jailed about 15,000. At least 1,000 people have been sentenced since December, all in groups of 10 or more and in often speedy trials. To know more about Saturday's protests against a military-backed law curbing protests, click here. 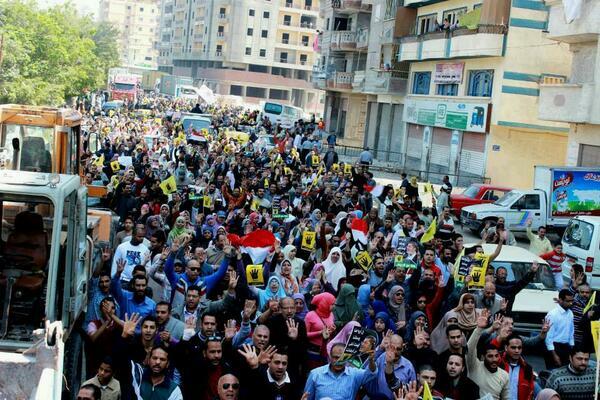 Hundreds of Egyptian activists demonstrated on Saturday against an anti-protest law. They marched to the presidential palace in Cairo calling for the scrapping of the law passed by Egypt's army-backed interim leadership in November to curb unrest that erupted after the army's overthrow of elected Islamist president Mohamed Mursi. The law requires anyone planning a demonstration to obtain police permission. Saturday's protesters did not. A few threw stones at the police, who did not react and there was no serious violence. Al Jazeera speaks with Zainab Sultan from the Doha Centre for Media Freedoms on Al Jazeera's journalists still detained in Egypt. US Defense Secretary Chuck Hagel has informed his Egyptian counterpart of President Obama's decision to deliver 10 Apache helicopters in support of Egypt’s counter-terrorism operations in the Sinai. A statement from the Department of Defense says the US believes these new helicopters will help the Egyptian government "counter extremists who threaten U.S., Egyptian, and Israeli security. This is one element of the president’s broader efforts to work with partners across the region to build their capacity to counter terrorist threats, and is the United States’ national security interest." The email from US State Department spokesperson Jen Psaki has, according to a congressional aide, cleared the way for the release of US Apache helicopters to Egypt and some of its annual $1.3bn military assistance package to the country so it can deal with security and counter-terrorism. 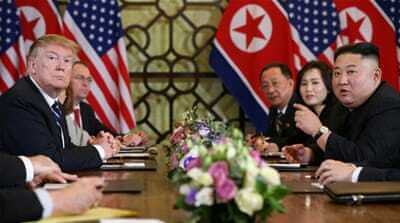 The unnamed congressional aide is cited in a report from the news agency Associated Press. US Secretary of State John Kerry spoke with Egyptian Foreign Minister Fahmy on Tuesday. In a statement from US State Department spokesperson Jen Psaki, Kerry noted that "he is not yet able to certify that Egypt is taking steps to support a democratic transition" and urged Egypt to conduct "free, fair and transparent elections". The elections are due to take place on May 26 and 27. 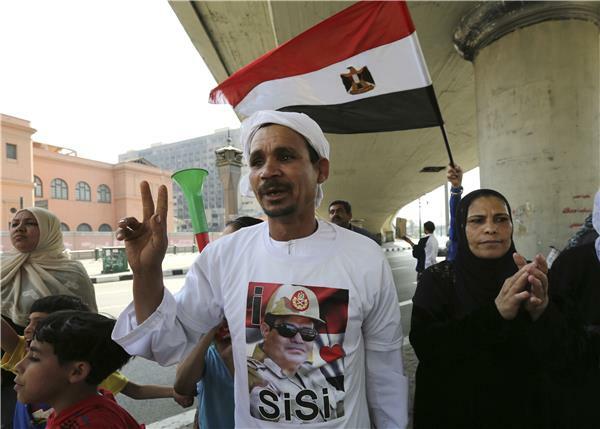 Retired army chief Abdel Fattah el-Sisi is widely expected to win the vote. Correspondent Peter Greste and producers, Mohammed Fahmy and Barher Mohamed, who have been imprisoned in Cairo for 115 days, were not granted bail at Tuesday's hearing and are to remain in prison until the next hearing. It was the sixth session of the trial heard in the Cairo court and was supposed to be the final opportunity for the prosecution to present evidence against the journalists. Al Jazeera speaks with journalist, Shahira Amin. An Egyptian court sentenced a senior leader of the outlawed Muslim Brotherhood to a year in jail for insulting a prosecutor, judicial sources said. Mohamed Beltagi and Morsi were both in court Saturday accused of inciting the killing of opposition protesters outside the presidential palace in Cairo in December 2012. Their trial is part of a relentless crackdown targeting Morsi and the Brotherhood since the military ousted him in a military coup in July 2013. The sources said Beltagi, who is currently in custody along with scores of other Brotherhood leaders, was condemned for "insulting" a prosecutor during Saturday's hearing, but without elaborating. It is the first time a senior member of the Brotherhood has been given a jail sentence since Morsi's ouster. Beltagi's lawyer Mohammed Abu Leila told AFP news agency that such sentences cannot be appealed. 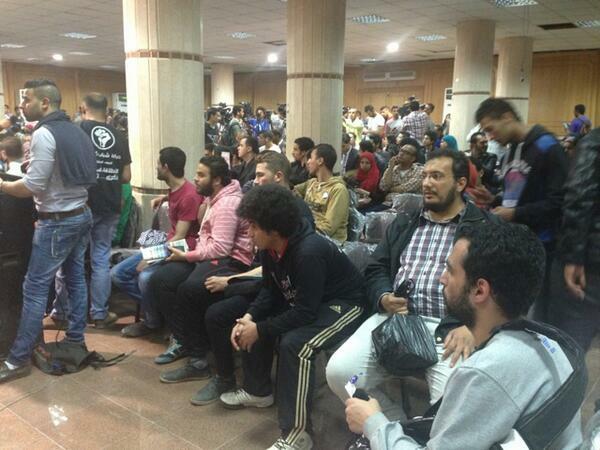 Both Morsi and Beltagi are also on trial in two other cases on jailbreak and espionage charges. If found guilty, the defendants could face the death penalty. 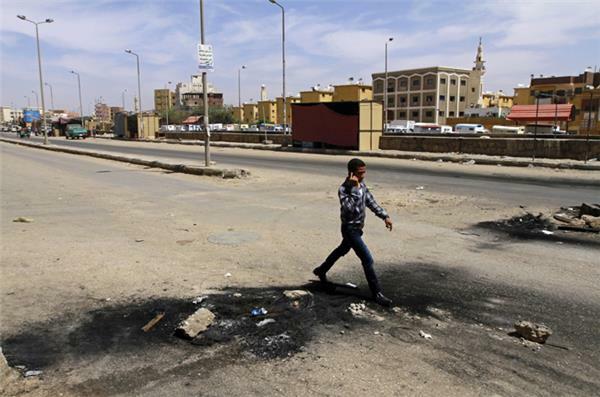 The Egyptian militant group Ajnad Misr has claimed responsibility for a blast that killed one police officer in Cairo. The bomb exploded in Cairo's Lebanon Square on Friday night, killing the officer and wounding another. Ajnad Misr, or Soldiers of Egypt, said in a statement on an Islamist website that its militants had monitored a police checkpoint in the square before detonating the bomb. The group formally announced itself in January saying it would target "criminal elements" in the military-backed government. It has claimed at least six attacks since then, including explosions outside Cairo University which killed a police brigadier-general and one other person earlier this month. Al-Qaida leader Ayman al-Zawahri has given his blessing to attacks of Egyptian jihadis on the police and army, but said they should avoid harming civilians. In an audio interview with al-Qaida media arm as-Sahab posted early Saturday on a militant website, al-Zawahri advised jihadis that any armed confrontation should be popularly supported and that victory cannot be achieved without this support. Al-Zawahri said the jihadis should choose their targets very carefully and explain the aims of each operation to the people. Today; Leftist presidential hopeful Hamdeen Sabahi has officially submitted about 33000 signatories “ statements of support” to run for president. Sabahi is one of several public figures who have recently announced their bids. He is a former presidential contender, came third in the 2012 presidential elections. A student was shot dead Monday during clashes between supporters of Egypt's ousted president Mohamed Morsi and police in Cairo University, security officials said. Clashes erupted when student supporters of Morsi staged protests on university grounds, the officials said, adding that police fired tear gas at from outside the campus and arrested 13 demonstrators. Clashes were also reported in the University of Zagazig, north of Cairo, where three students were wounded and three were arrested. Student backers of Morsi have regularly protested on university campuses as a police crackdown on the ousted leader's supporters has weakened their ability to stage large street protests. 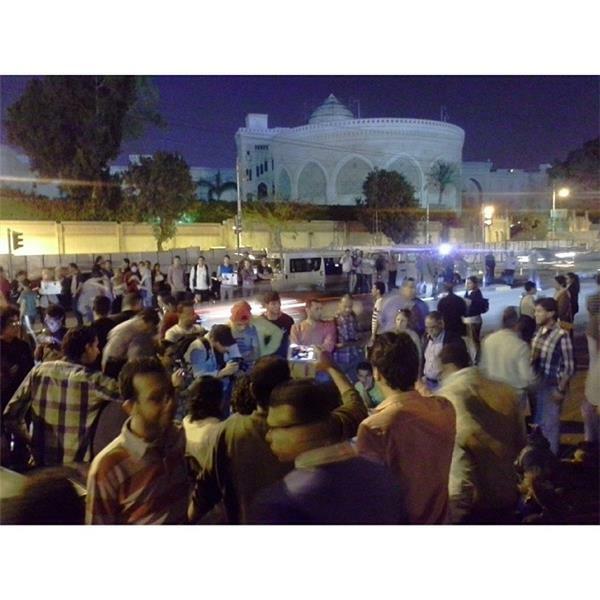 A journalist was wounded while covering the clashes in Cairo University, his employer and witnesses said. Youm 7, an independent newspaper, said Khaled Hussein was shot in the chest. The Egyptian Al Ahram newspaper is reporting that two Egyptian journalists were shot and injured while covering clashes at Cairo University between security forces and students. One student was killed during the Monday clashes, local media said. An Egyptian court sentenced a former presidential hopeful to one year in prison on Saturday for insulting the court, state news agency MENA reported. Hazem Salah Abu Ismail is on trial for fraud in a case related to presidential elections in 2012 which brought the now ousted President Mohamed Mursi of the Muslim Brotherhood to power. Abu Ismail interrupted his court-appointed attorney during Saturday's session and told the judge, "I don't feel like I am before a court," a judicial source told Reuters. Abu Ismail, who has links to the Brotherhood, was disqualified from that election after reports that his late mother had held a U.S. passport. Under Egypt's election rules, both a candidate's parents must hold only Egyptian citizenship. He was sentenced to a year in prison in January after making a similar statement. The correspondence was given to Al Jazeera by al-Shami's wife Gehad Khaled. 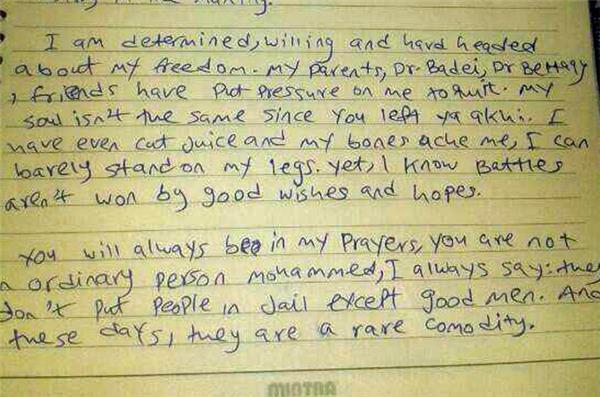 Al Jazeera has obtained letters from Abdullah al-Shami to fellow prisoner Mohamed Soltan. 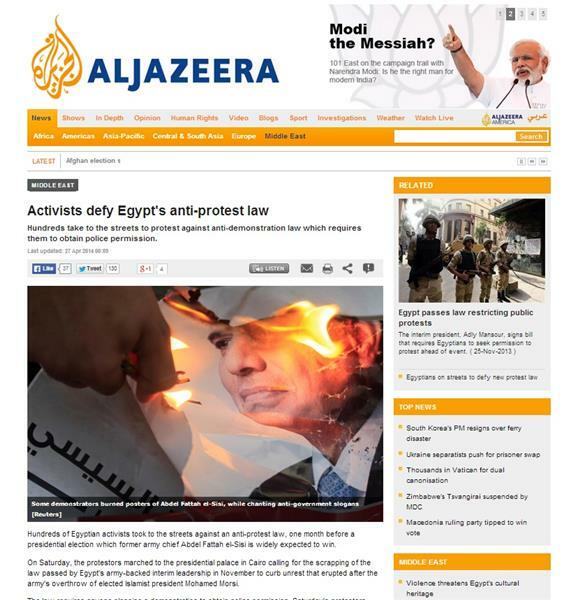 The Al Jazeera Arabic journalist has been held by Egypt's military appointed authorities since August without charge. In the letter al-Shami talks about attempts by his friends, family and fellow prisoners to end his 81-day hunger strike, which he says is taking a toll on his health. 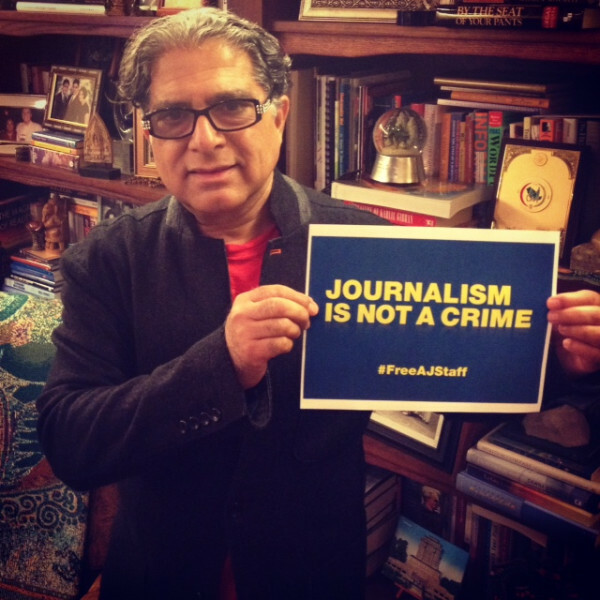 A-Shami is one of four Al Jazeera journalists held by Egypt's government. Peter Greste, Mohamed Fahmy, and Baher Mohamed from the network's English channel are falsely accused of providing information to the outlawed Muslim Brotherhood. Their trial has been adjourned until April 22. An al-Qaida inspired group in Egypt has posted a video online showing a suicide bomber attacking a security headquarters in the Nile Delta city of Mansoura, an assault that killed 16 people in December. The video by Ansar Beit al-Maqdis, or the Champions of Jerusalem, also said the suicide bomber previously was injured in Islamist demonstrations against the ouster of Islamist President Mohamed Morsi by Egypt's military. The comment marks the first time a suicide bomber in the widening campaign of militant attacks striking Egypt has been directly linked to demonstrating Morsi supporters. The 16-minute video named the bomber as Imam Mahfouz or Abu Mariam. It showed footage of him, wearing a white robe sitting next to Kalashnikov assault rifles, criticizing the Egyptian military for protecting Israeli and helping Syrian President Bashar Assad in his civil war. "Those of the military are who are killing Muslims... must be killed," he says. "We kill as they killed." The Egyptian government has stepped up a campaign to influence the message preachers deliver in mosques. A report by Reuters news agency said the state had given licenses to more than 17,000 clerics to give Friday sermons in order to curb suspected Muslim Brotherhood influence in places of worship. The military-appointed interim government has been trying to bring mosques under tighter control since the overthrow of former President Mohamed Morsi last July. All of the newly-approved clerics had been trained at Al Azhar University, which a government statement said is a respected centre of Sunni Islamic learning and insitutions run by the ministry of religious endowments. 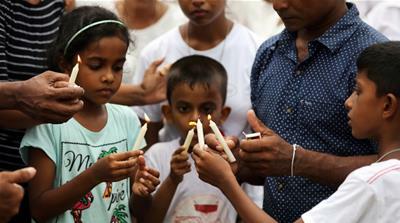 The statement added that the move would "strengthen" the ministry's supervision of mosques so that they would not "fall in to the hands of extremists and the unqualified". Around 12,000 clerics not approved by the state have been removed from service and the minister of religious endowments said he aims to bar 55,000 unlicensed preachers. This video uploaded to Youtube by privately owned Egyptian newspaper Al Masry Al Youm is said to show Egyptian forces firing tear gas and birdshot at protesters outside Cairo University. Al Badil newspaper, a Cairo-based private-owned publication, reported on Wednesday that members of presidential hopeful Abdel Fattah's el-Sisi's electoral campaign will launch a party called "Democratic Dawn" in support of the former defence minister and the country's army. An Egyptian appeals court rejected Wednesday a request that new judges be appointed for two trials involving ousted Islamist president Mohamed Morsi, judicial officials said. The trials are part of a sweeping crackdown waged against Morsi and his Muslim Brotherhood since the army overthrew him in July, and the former president could face the death penalty if convicted. The court is now expected to set a date for the resumption of each of the two trials involving jailbreak and espionage charges, the officials said. Egypt's private-run newspaper Egypt Independent reported on Wednesday that the cabinet will submit the new counter-terrorism draft law to the president for approval after it has been revised by the state council. According to the publication, the draft bill's 86th article defines the terrorist act as the use of force, violence, threats, or intimidation in order to disturb public order or endanger the safety, interests and security of the society, harming individuals, intimidating them, putting their lives, freedoms or security at risk, harming the national security, harming the environment, monuments, natural resources, money, buildings, public and private properties, occupying or seizing public and private properties, hindering the work of, activities or some of the activities of public authorities, judicial bodies, local units, houses of worship, hospitals, education institutions and institutes, regional and international bodies in Egypt, and diplomatic and consular missions. Instagram user badawpepo posted an image which he alleges was taken at a sit-in called for on Monday after a court rejected an appeal by prominent activists Ahmed Douma, Ahmed Maher and Mohamed Adel, endorsing a previous verdict of three years in jail for each. Pictures circulated social media, especially twitter, of alleged sit-in against the anti-protest law and release of prominent activists detained because of it. An Egyptian appeals court on Monday upheld convictions and three-year prison sentences handed down to three of the country's most prominent political activists, a ruling that is likely to revive opposition to a draconian protest law they were accused of violating. It is also certain to deepen the rift between Egypt's liberal and secular pro-democracy campaigners _ many of whom participated in the 2011 popular uprising against Hosni Mubarak _ and the current military-backed government. The ongoing campaign against dissent and pro-democracy activists has been overshadowed by a much larger crackdown against the Muslim Brotherhood group and other Islamists. That push has led to the death of hundreds and the jailing of at least 16,000 people since the July ouster of President Mohammed Morsi. The ruling sparked a storm of anger on social media networks, with dozens of activists calling for a sit-in outside the presidential palace in the Cairo suburb of Heliopolis. 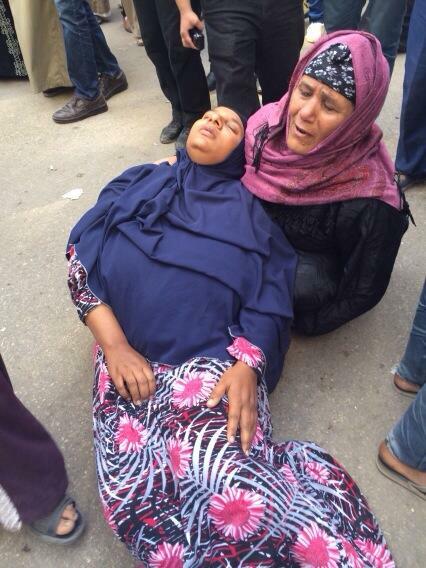 The wife of Ahmed Douma, one of the three activists, wrote on her Twitter account that she was headed there. Douma suffers from stomach ulcer and has complained in past court hearings that he was not being properly treated in jail. A man walks past a debris left after clashes Saturday between a Nubian family and members of the Arab Haleyla clan, in the southern city of Aswan, Egypt. Clashes between an Arab clan and a Nubian family restarted Sunday in Egypt's south, leaving one person killed and four injured, state TV said, despite high-profile government mediation to end the protracted feud that has now claimed 24 lives. A Nubian resident reached by telephone said gunmen from the Arab Haleyla clan were attacking his neighbourhood Sunday on the edge of Aswan city. He said: "We are dying. They are attacking us." He spoke on condition of anonymity because he feared for his life. The renewed clashes came shortly after the local governor visited the area. 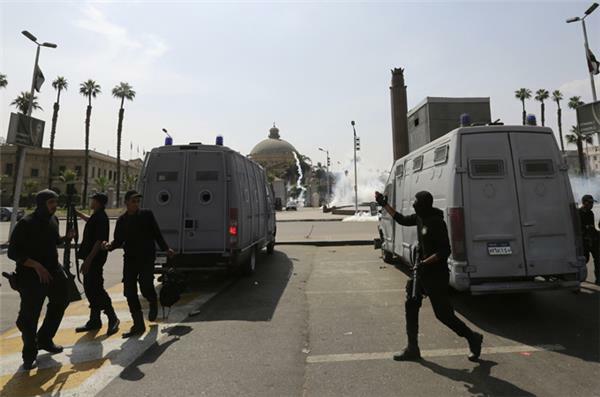 An Egyptian court on Saturday sentenced a police officer to death for the 2012 killing of two men in the southern province of Qena, state news agency MENA reported. Mahmoud Fathi Ali Al-Ataar, a police captain, was standing trial on charges of killing a local driver and a salesman in January 2012 and stealing 130,000 Egyptian pounds ($18,600) from the men. The judge in Qena ruled that the policeman's file be referred to the mufti, the country's highest religious authority to whom death sentences are always sent for review. The judge scheduled the next hearing in the trial until June 2, pending the mufti's review of the sentences, state news agency MENA reported. Today Morsi's trial for allegedly inciting to kill demonstrators at the presidential palace in December 2012 continues. 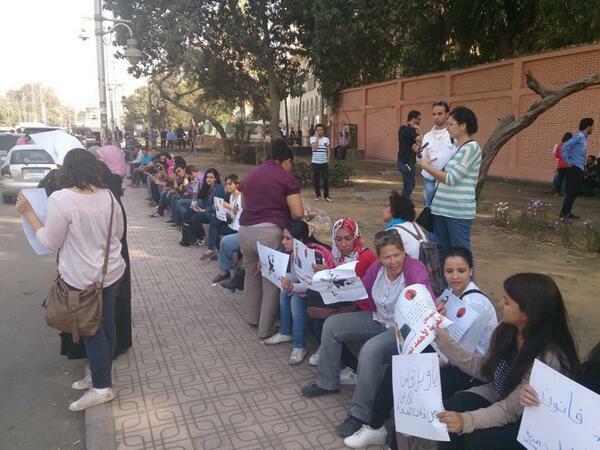 Journalists in Egypt held a one-day strike, demanding security forces protect reporters covering protests. They also demanded their employers provide protection as their job grows increasingly dangerous. The strike comes a week after a young journalist was killed in Egypt while covering clashes at a protest by Muslim Brotherhood supporters. Human Rights Watch has cautioned Washington against resuming military assistance to Egypt until its military-backed government ends alleged rights abuses and holds violators accountable. The New York-based advocacy group on Friday released a letter it had sent earlier in the week to US Secretary of State John Kerry, following comments indicating that he would make a decision on aid resumption in the coming weeks. Washington cut assistance to Cairo in October, withholding deliveries of tanks, fighter aircraft and other military equipment, as well as $260m in cash aid after authorities used violence to put down protests following the ousting of Mohamed Mursi, Egypt's first freely elected president.